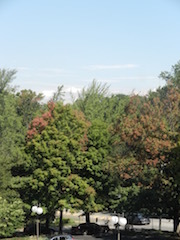 Note: These photos are of the trees where I live, just beginning to change. 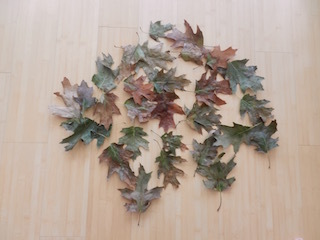 The leaves on the floor I plucked from the pool. 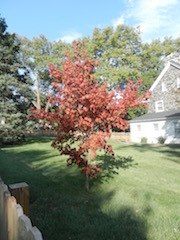 The red Japanese Maple is already completely red. The first and last photos are just beginning to show signs of color. Autumn’s in the air, with shorter days & crispy nights. Floating down on the whim of a breeze. a rich mixture of colors, an autumn craze. Flaming foliage comes once each year. Oh, to feast on a never-ending autumn diet! This entry was posted on Thursday, September 22nd, 2016 at 7:31 am	and is filed under Poetry / Quotes / This 'n That. You can follow any responses to this entry through the RSS 2.0 feed. You can skip to the end and leave a response. Pinging is currently not allowed. 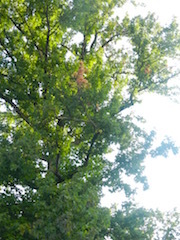 Thank you for the beautiful poem on the first day ( almost ) of fall.